Balloon twisting is great for all events! Everyone loves balloons from little kids to big kids! From a birthday party, a store opening, a cover band and a wedding! Balloons create a memory and a buzz! Depending on time the balloons can be simple to more extreme! A party of 10- 20 kids can be from an hour to two hours! We can walk around or set up a table with a line to follow! A store opening to create a buzz works best from three hours to 6 hours! Everyone will come through your door and stay for a while for a balloon. Restaurants can create a huge buzz and customer loyalty on a special night. Works best for a three hour time period. 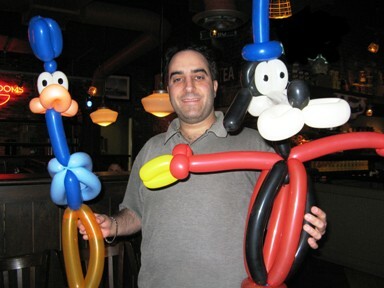 Just like Children want a happy meal for a toy they will want to visit your restaurant for a neat balloon. For large events we can supply multiple balloon artists and as always other entertainment. With Promo Magic you get our entertainment but also our ideas to work with you to assist in the creativity of your special event. We love what we do and enjoy being more creative all the time! Our goal is to work with you now and the near future! The best business is repeat and referrals and that is always the best way to thank us. How about a workshop where you child learns how to twist balloons? Great for kids age 5 to 105!